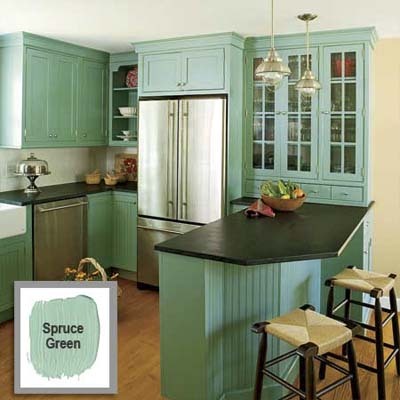 In this kitchen, we sanded the cabinets, painted the interior white and used a water based sage green stain on the exterior and use plate racks to display everyday and colorful dishes and bowls. A microwave and whimsical wine rack complete the picture. But you could also use square baskets to hold cereal and other food items, or use wine glass holders or other specialty fittings to display your special kitchenware. You’ll probably want to do this only for cabinets and items that get frequent use so that dust doesn’t build-up. Sometimes all a kitchen needs is a new coat of paint. The turquoise of this kitchen is a perfect complement to the white, brown and grey of the rest of the palette. See other color ideas from Emma Christensen here. And don’t forget the ceiling – whether you paint it an accent color (like here) or a pale complementary color to the walls—think about something other than ceiling white. We took builder-grade golden oak cabinet and gave them a custom mixed stain somewhere between ebony and red mahogany – it feels like a completely new kitchen.